Award-winning Cedar Hill Continuing Care Community has received approval from the U.S. Department of Housing and Urban Development (HUD) for a $9 million insured mortgage toward a $10.64 million expansion of The Village at Cedar Hill, a two-level addition to include a 20-person memory care facility as well as 20 independent and assisted-living apartments. Groundbreaking on the project is slated for February 2014. Designed by Mackenzie Architects of Burlington, the expansion will add 41,866 square feet to the existing Village, tripling the size of the assisted-living facility in terms of both physical space and resident capacity. The project has been in the planning phases for four years, and the completed facility is expected to open in January 2015. Construction managers anticipate the expansion will bring about 40 construction jobs to Windsor. 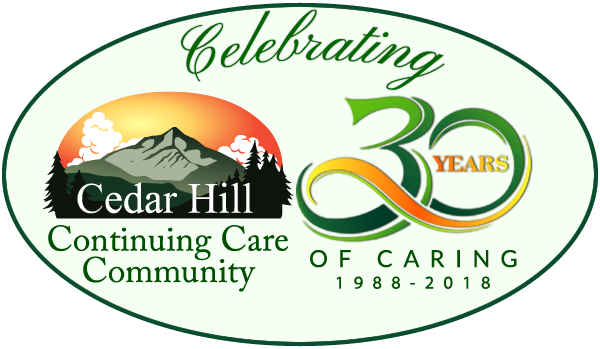 In addition to the Village, which last year earned a Bronze Award from the American Health Care Association, Sayles and Horn operate Cedar Hill Health Care, a 39-bed skilled-nursing facility offering long-term care, short-term rehabilitation, and hospice services. It has earned a five-star rating from the Centers for Medicare & Medicaid Services (CMS). A third facility, Victorian House at Cedar Hill, provides care for 13 residents in a comfortable, home-like setting. All three of the facilities are located on Cedar Hill’s campus along Route 5 in Windsor. Cedar Hill Continuing Care Community has a long history in Windsor and employs nearly 100 individuals. Founded in 1988 by Sayles and fellow registered nurse Judy Brogren, the campus serves residents and families from both sides of the Connecticut River and is well regarded by locals.The new memory care facility will be dedicated to Brogren, who is now deceased. 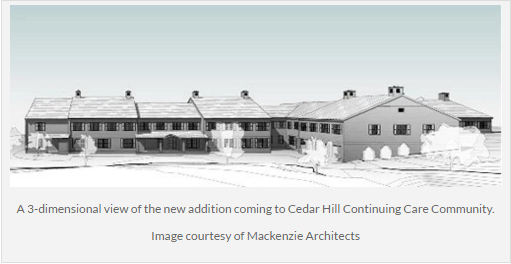 The existing Village at Cedar Hill houses 21 one- and two-bedroom apartments and common areas in 17,854 square feet.The expansion will add two levels and increase the square footage to 59,720. One floor will feature 20 one- and two-bedroom apartments and studio apartments for independent and assisted living. Common living spaces will include a living room and dining room, pub, multipurpose activity room, fitness center, salon, library and computer center. The lower level will feature a comfortable, secure living area dedicated to care for individuals with memory loss and staffed around the clock by professionals specially trained in memory loss care. Twelve private apartments and eight semi-private apartments will surround a large common area with country kitchen, dining room, living room, activity room, salon, greenhouse and art center, and a secure outdoor garden area. Throughout the facility, there will be plenty of room for residents to take walks. Owners Sayles and Horn look forward to sharing construction updates with community members on a regular basis.